This is how I felt during my two-hour visit last week to the orthodontist to get fitted for my upper mouth splint. This beast is far more cumbersome and intrusive than the lower one I have worn for the past three months. The pressure is painful,l and the splint forces my tongue into an awkward position. Talking is difficult – I sound like I have several speech impediments – and eating is next to impossible. Thank goodness I can still swallow wine, and chocolate melts in my mouth. Every thing else dribbles out – Must Find Trendy Bib! This is the final part of recovery from my (most recent) bike crash last August. I’m trying to be grateful and not complain. Some days that’s easier than others. I am hoping my jaw inflammation will be significantly reduced; my bite will be properly re-aligned; and – especially – that I can overcome my fear and enjoy this biking season without further mishap! Win, wine, whine – they all work on certain days 🙂 Hope you have a restful, creative weekend. Hugs! Awe Sammy your a trooper it sounds painful I must say but it will be worth it in the end. I didn’t realize the zentangle looked like teeth and little braces coils until I finished it (altho’ I don’t have braces; it’s a full splint). I’m glad you “saw” the teeth in it. Thank you, Justine! I bought the pens online Amazon but you can find them in an office supply or art supply store. I got a 5-pen black set – different size tips – and a six-piece color set. You get 5 blank white tiles included in the black set. I didn’t buy any additional tiles; I just measured art paper and cut 3 1/2 X 3 1/2 squares and used a thicker perma marker to outline the border. First! I think it’s an intriguing picture. AND THEN! You wrote some really serious stuff! It must have been awful!!! Thanks, Ninna. As you know, we all have good and bad days. I’m just especially sensitive to things that create sores in my mouth and disrupt proper swallowing because I’ve had so many digestive problems through the years. I keep telling myself the pressure this brace is causing means my “bite” is being repositioned, which is a good thing, but it just gets to me once in awhile. Oh I know so well about that! Some days are just awful! Thanks! The same to you! For the last two days I’ve been working a great deal with the appearance of the blog. Fun, but it takes some time to do it! Awesome drawing! I feel that way at the dentist too. Here’s hoping for a speedy recovery. I’m sure all of this will be worth it in the end. Thanks, Liane. Visiting the dentist has to be right up there with pap smears and colonoscopies! All necessary and beneficial but take a lot of “gearing up” to get through the door. I do trust my orthodontist and know this is what’s needed. Never had a colonoscopy yet, but I agree about pap smears too. I swear I come off the dentist chair and gyno table with cramps in my hands, dripping in sweat, and feeling like I need a nap. Glad you have a trusting relationship with your orthodontist. EEK! Since I met you only recently, I had not realized that you were in the midst of this painful event! To a full and speedy return to the trails! Cheers! Thanks, Maggie. I have been through a few crashes in my 60 years of biking, and haven’t been scared to get back on the bike until this one. Probably cumulative injuries, recoveries and age are what’s doing it. I have to buck up and Be Brave, and I will because I can’t NOT ride. Just not quite there yet! That all sounds terribly painful. With a little bravery, which I’m sure you have, you’ll be able to conquer that fear in no time. Yes, I’m looking for that bravery. Right now it’s not showing its face, but honestly it’s been a tad windy and cool to venture out. This weekend and next week are supposed to be much warmer, so I won’t be able to resist, and will be extra cautious. Yes, 80’s! I love summer and you being a bicyclist, you must love it too. Oh, ouch! It even sounds painful. I feel for you. Hope you heal fast. Yeah – this one was my worst, but I’m determined to overcome my fear of crashing again. Biking has always been such a “zen, life affirming” activity for me, and I don’t want to give in to fear. Will start with jaunts around the neighborhood and work my way back to the trails I love. Hi Carrie – thanks for your sympathy 🙂 Just 2 1/2 more months, then I should be done. I liked the bottom brace better – all that did was provide support for my jaw and take the pressure off, so the inflammation was reduced. That was the “rest period”. Orthodontist called the upper brace the “work horse.” It’s more like “torture chamber”. But then I think of people with wounds and injuries so much worse than mine, and my pity party is over pretty quickly. I love your positive attitude and your sense of humor. I’m sure it would be difficult to tolerate your recovery without either! Yeah, humor (even black humor when necessary) gets me through most things … eventually 🙂 Thanks for checking in. I thought there’d be dead silence for posts and comments for a few days after A to Z, but my reader keeps bringing me “good stuff”! Some have already finished their A to Z recaps. Have you? I’ll work on mine this weekend. The most time-consuming part for me is figuring out how to replace the Challenge badge with the I Survived badge on my website. I hate that kind of techy linky stuff because I forget and always start back at square one on the learning curve. Carrie – now I see why you barely have time for blogging. Writing a novel, arduous submission process for contest AND providing great “how to” lesson to newbie authors. Looked up your first book on Amazon, and put it in my wish list to purchase with my next order. Always looking for good reads! I truly sympathize with the fear–I broke my back in a boating accident in 2006 and have been out on the boat a total of two times since then. I’ve decided that THIS summer is the one during which I. Must. Overcome. The. Fear. My husband and I both recently bought new mountain bikes and have been waiting with varying degrees of patience for winter’s snows and spring’s rains to let up so we can try actually riding them. Neither of us has been on a bike since we were kids. Melinda -I’m really sorry about your boating accident. You know the fearI’m talking about. I do hope you both enjoy your new bikes and have paved or gentle dirt trails to ride. It is a joy for me – most of the time! Devoted riders like you inspire us! Thanks, Jane. 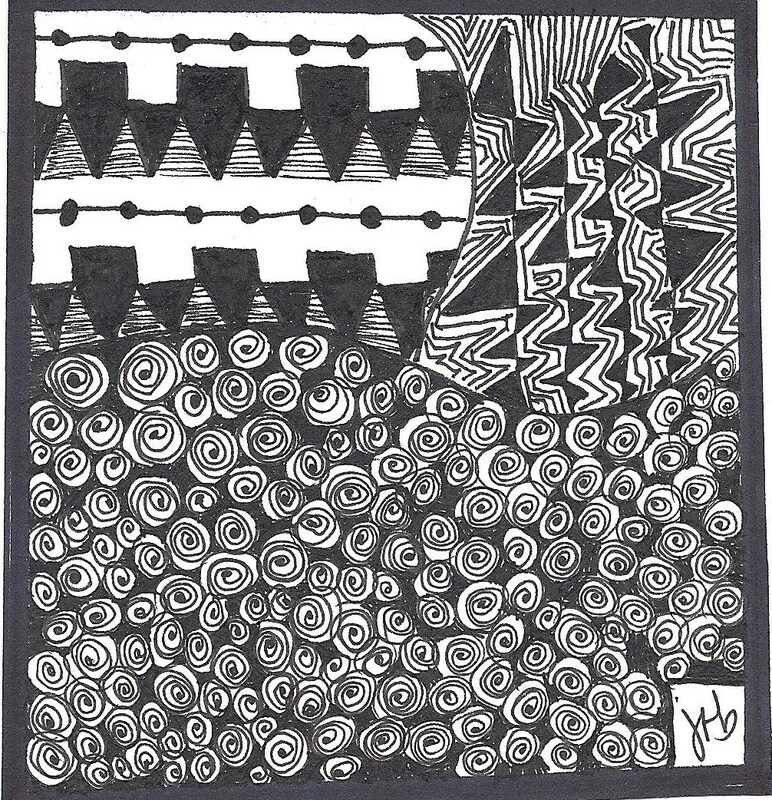 I’m seeing patterns everywhere since I started zentangling. Another thing for my mind to point out to me as we journey through the day! I wish you a very speedy recovery and I’m sure you will be able to get back on the bike in no time! Thank you, Samantha, for your well wishes ! I hope that you are mending well! Thanks, Misty. I know I’ll feel much better in a couple months when I’m done with this mouth splint. Thankfully i’m not hsmpered playing golf and biling. I appreciate your visits and comments. So great to meet such talented writers.